Four of the top ten scientific breakthroughs of 2011 selected by Québec Science magazine were achieved by McGill-led teams. The work of the four teams is featured in the February issue of the magazine, now available in newsstands. 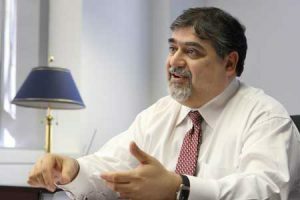 Vassilios Papadopoulos (Faculty of Medicine; Executive Director and Chief Scientific Officer of the Research Institute, McGill University Health Centre). By evaluating the acidification levels of the bottom waters of the St. Lawrence Estuary and Gulf from the 1930s to today, Alfonso Mucci (Department of Earth and Planetary Sciences, Faculty of Science) and his collaborators have revealed the vulnerability of these waters and their impact on the marine ecosystem of that region. Vassilios Papadopoulos (Faculty of Medicine; Executive Director and Chief Scientific Officer of the Research Institute, McGill University Health Centre) and his team have developed a blood test that could soon be used to diagnose Alzheimer’s disease, helping detect and treat the devastating disease earlier. Patients who suffer from chronic pain are subject to cognitive impairment. Laura Stone (Faculty of Dentistry, Alan Edwards Centre for Research on Pain) and her team discovered that once the pain was eliminated, it was also possible to reverse the abnormal changes seen in the brain. Orthopedic surgeons Paul Martineau and Edward Harvey (Faculty of Medicine and McGill University Health Centre), in collaboration with Louis-Philippe Lefebvre of the National Research Council of Canada, have patented a screw made of titanium foam that could replace the screws made of stainless steel that are currently used to treat broken bones, and thus lead to a faster recovery.